Confusion about phone tariffs means mobile customers could be wasting £8bn a year, an online price comparison service has warned. Moneysupermarket said users often do not know how many minutes or texts are included in their monthly package, or how many they actually use. This leaves them prone to incurring extra charges, which could add up to £130 each per year. Moneysupermarket said that many users did not know the terms of their deals. 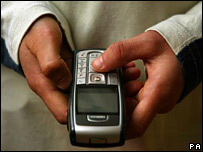 According to the research, the typical mobile phone package gives customers 166 voice minutes and 133 text messages. However, Moneysupermarket found that the average customer uses an extra 23 minutes and sends 23 texts over and above their monthly allowance. Industry statistics suggest there are more than 65 million active mobiles in the UK, so collectively these extra charges could cost users billions. One of the biggest problems is a lack of awareness of contract details, and about how people use their phones in practice, Moneysupermarket said. One in seven customers questioned did not know how many free minutes they have, while one in six was unsure how many texts were included. A similar proportion could not say what they paid for their monthly line rental. As a result, a fifth of users admitted receiving bills for more than they expected. "People should check their monthly bill regularly," said Rob Barnes, Moneysupermarket's head of mobiles. "The reason mobile phone operators can offer such good contract deals is by charging customers for additional services," he added. He urged consumers to read through their phone contract and make sure they understand the cost of any extra calls or text messages. "If they're using up all their allowance it's worth considering a move to a different tariff with more inclusive minutes and texts - it could save a lot of money in the long run," he added.